In 2003, Roman Abramovich started sowing seeds for one of the most captivating transition stories in English football –Stupendous wealth, shrewd recruitment and astronomical ambition surpassed only by the will to dominate and rewrite Premier league history. Meanwhile, there was a certain Mr. Sarri cutting his teeth in the Tuscany regional leagues. Doubling as a bank clerk and a student of economics, the football-obsessed Italian used his spare time for coaching, but it was only after winning promotion with sixth-tier Sansovino in the early 2000s, that Sarrismo really took flight. While the Roman revolution kicked into full gear and changed the face of Premier league football for ever, Sarri rose through the lower levels of Calcio, and although he’s not necessarily the kind of serial-winning manager Chelsea always crave, the 59-year-old has evolved into the most coveted tactician in Italian football. Unlike Jose Mourinho Carlo Ancelotti, or Rafa Benitez, who had varying spells in England, Madrid and Italy, Maurizio Sarri’s only top-level experience came during his Napoli years, but the former banker can draw inspiration from the good fortunes of Carlo Ancelotti, Roberto Di Matteo, and Antonio Conte, Compatriots who left big footprints on the sands of the bridge. During the Roman revolution, Champions league football has become a constant, and although the blues have found themselves in the Europe’s second competition just twice (2012 and currently 2018) in over a decade, the West-London club have had managers with tactical-expertise suited to the task at hand. In the eye of the storm, Rafa Benitez replaced Roberto Di Matteo, and while the Portuguese sought redemption elsewhere, the former Liverpool manager made history in Amsterdam, leading the Champions league holders to a 2-1 victory over Benfica in the 2013 Europa League final, and in the eleven days that followed, Chelsea enjoyed possession of two European silverwares. It was fun while it lasted, ask any Chelsea fan within reach. Ironically, in one of Napoli’s most inspiring league campaigns since the days of Diego Maradona and Gianfranco Zola, Maurizio Sarri prioritized the Scudetto over Europe’s second-tier competition, and although the Partenopei came agonizingly close to unseating the Juventus in an intriguing Scudetto race, nightmares of bowing to tactically inferior (RB Leipzig) in Europa league round of 32 still haunts the indigenous peoples of Naples. Nevertheless, Bar Pep Guardiola’s Manchester City, it’s hard to imagine a team that played more hypnotizing football than SSC Napoli en route Russia 2018. With Salah, Firmino and Mane, Liverpool were phenomenal, Barcelona were Barcelona and Real Madrid continued to toy with Europe, but the flair, freedom and chemistry with which Sarri’s men played made the little donkeys arguably the most admired side on the peninsula. Forming the spine of a ruthless Napoli army, Dries Mertens, Lorenzo Insigne, Jorginho, Allan, Hamsik and Kalidou Koulibaly became Sarri’s most trusted generals, and although only one of them now trains with him in London, the Italian tactician is already assembling a machine potentially more destructive than his Neapolitan masterpiece. The former Empoli manager is in a league of his own and now sits on the left-hand side of Guardiola in the hallowed chambers of tactically offensive tacticians, but Maurizio Sarri knows too well the dangers of getting carried away with in the wind of expectations. “But at this moment, at this current speed, it may be a problem” Sarri said upon resumption of duties at Cobham. The fascinating trio of Kante, Jorginho and Kovacic/Fabregas looks very complementary on paper, each possessing a defined skillset capable of upholding the tenets of Sarriball: The interception of the Frenchman, the mesmerizing vision of Jorginho and Fabregas, and then there’s Kovacic, whose defensive aggressiveness and dribbling skills completes the triangle of what should be a well-oiled midfield machine. Two of Chelsea’s goals under the Neapolitan have come from the unlikeliest of sources; Kante and Jorginho –while the Italian midfielder has developed into a living embodiment of Sarrismo, it is the chemistry in the middle of the park that ultimately determines just how well Sarri’s ideas will be transformed from paper to silverware. Three goals, three points and a clean sheet on Matchday one; very impressive, but on an overwhelming afternoon in West Yorkshire, any group with Chelsea’s quality could have dispatched the Terriers. Yet, the narrow 3-2 win against Arsenal in a swashbuckling London derby is proof that there’s still room for improvement, and Sarri’s recent comments on “moving the ball quicker, pressuring defenders, and improving in the defensive phase” couldn’t have come any quicker. The Tuscan said following Chelsea’s victory over Arsenal. Defensively, the record-breaking arrival of Bilbao-bred Arrizabalaga and the experienced hands of Robert Green more than makes up for Thibaut Courtois’s switch to Madrid, and although not signing new defenders could be down to Maurizio Sarri’s faith in the quartet of Rudiger, David Luiz, Azpilicueta and Marcos Alonso fitting perfectly into the defensive plot of his puzzle, the role of Victor Moses, Christensen and Zappacosta as spare-parts could be a reason for concern. These are not the best in their respective positions, but we’ve seen what Sarri did with Koulibaly and Hysaj, it will be unnecessarily pessimistic to conclude that he cannot forge another defensive machine with the tools at his disposal. A clean sheet away to Huddersfield was no way to measure an impregnable defense in a league that’s from a physical point of view, tactically different from Serie A, and even when Chelsea’s back-line came short against Man City and against Arsenal, it could take some time to measure the true strength and elasticity of Sarri’s backbone. Had Gonzalo Higuain picked London over Milan, his former Napoli boss would probably worry less about high conversion rates and consistency in front of goal, but with Leonardo and Gennaro Gattuso having the last laugh on that one, who says Maurizio Sarri cannot adopt the false-nine alternative if need be? The perfection of Lorenzo Insigne’s positional switch following Higuain’s move to Turin provides further proof that the absence of a lethal number nine is probably not a source of worry for Chelsea’s new boss. Maurizio Sarri doesn’t aim to please, but he strives to entertain and while his tactical thinking dwells upon high pressing, and diabolically passing opponents into submission, his fluid 4-3-3 theory will allow Chelsea’s forwards interchange freely, making it more difficult for opponents to cope in the final third. In the Roman era, Chelsea have become the most successful club in England, and even if Mr. Sarri’s methods inspired Napoli to three fascinating Calcio campaigns, the Tuscan tactician must know, that at Stamford bridge, trophyless campaigns are not tolerated. This is London, not Naples. It is appointed unto a Chelsea manager two seasons to make an impact, maybe three, but after that, comes Abramovich’s judgment. You have to win or you’re out. At Cobham, except you’re winning the Champions league every year (Even the great Zizou had to read the handwriting on the wall at Real Madrid), there’s no such thing as a long-term project. Much of Sarri’s inability to win silverware with SSC Napoli was probably down to Aurelio De Laurentiis’s failure to grant the Neapolitan’s transfer requests, but at Chelsea, the Italian manager is already enjoying plenty of backing from the powers that be. The Tuscan has had to wait for his chance at the very top, and although he didn’t rise through managerial academy ranks or serve under an established patron (like Mourinho and Pep under Cruyff), logic suggests, that it is Sarri’s unconventional route, beginning off the well-worn path, that has forged him into arguably the most talked about Italian manager today. Like Arrigo Sacchi and Johan Cruyff, Sarri preaches the gospel of playing beautifully –O jogo Bonito –and whether or not Sarriball will conquer England remains to be seen, but for now, it is up against Klopp’s heavy metal theory, Jose’s defensively knit devils, Pochettino’s Harry Kane army, and Pep Guardiola’s diabolically offensive shark team. In a league that is fast-paced and more physical than others, a foreigner’s first year is usually considered a transition phase, but if there’s anything we’ve learned from Mourinho, Ancelotti and Conte, it is that you can have an outstanding first year only to crash and burn suddenly. At a time when Stamford Bridge is in dire need of resurgence, and the absence of trophies in Sarri’s portfolio is becoming painfully obvious, the timing of Roman Abramovich’s thirteenth managerial appointment couldn’t have been more spot on. In Sarri’s first league test against a top six side, the introduction of Hazard and Kovacic in Saturday’s five-goal thriller helped Chelsea reestablish control and ultimately proved the difference against Arsenal, but the former Napoli manager believes the blues are not title contenders yet. “NO, not in this moment” the 59-year-old replied when asked if he sees the makings of a Chelsea title challenge. 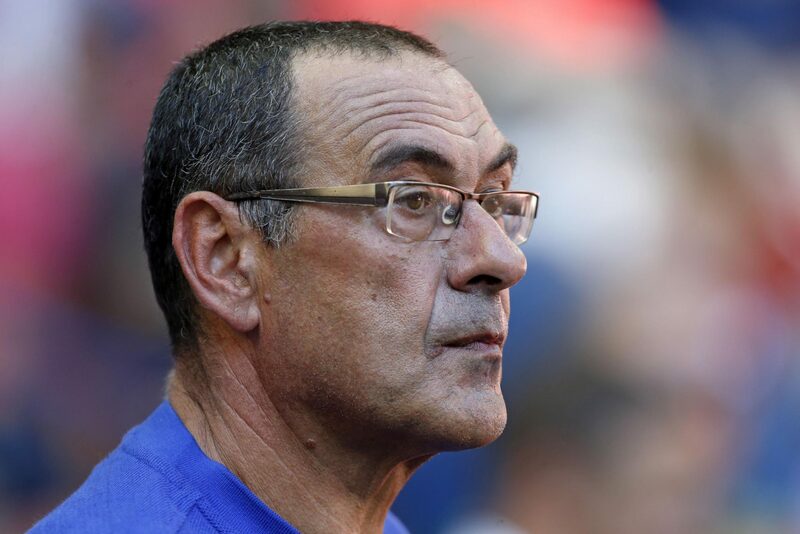 Someday, Premier league curtains will fall on Maurizio Sarri’s reign at the bridge, maybe sooner than expected, but for a 59-year-old who dresses like Zuckerberg and smokes like Charles Bukowski, the task of bringing back Chelsea’s glory days remains an exciting challenge.